Anita is an expert in health insurance, and I wanted to discuss with her the latest changes in health care and open enrollment. She likes to advise seniors with their health care insurance concerns. Health care costs are one of the things that can quickly drive people into bankruptcy. So this knowledge is a critical part of your abundant life and investments. Once you get sick, you need to understand what you are dealing with and it’s essential. 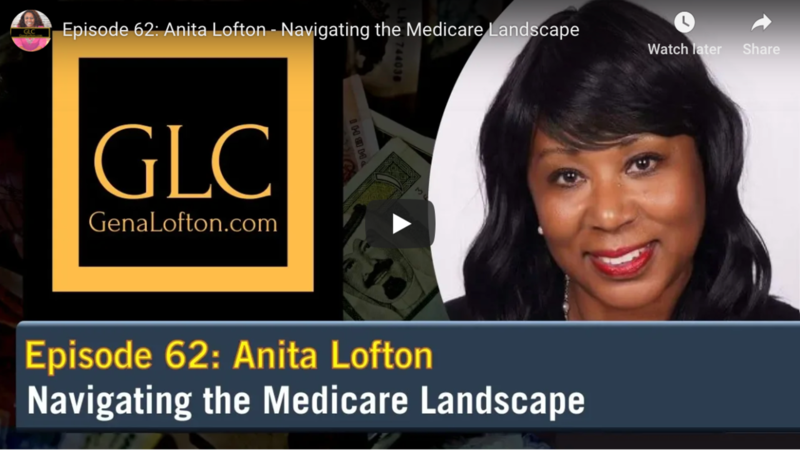 She explains the latest changes that have occurred with healthcare regulations. Under Trump, the tax penalty will be done away with, and they have changed some of the rules surrounding pre-existing conditions. 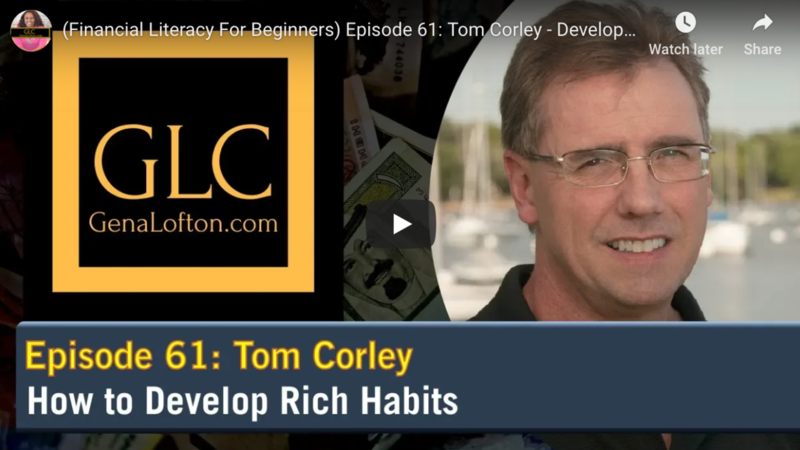 Tom is a motivational and empowering speaker at conferences and is the author of several books that discuss the habits of the wealthy and how they differ from others. He discusses his childhood and how his successful businessman father ended up losing his fortune through a business sale that went bad. He became interested in the habits of successful people when a friend with business problems asked him for advice. This sparked off an idea to conduct a study of people’s behavior and habits. Early on he asked the question, “What do you do with your time at the end of your work day?” He got a lot of different answers, and he noticed that almost all of the wealthy people spent time away from home doing things that increased their knowledge and expanded their connections with others. 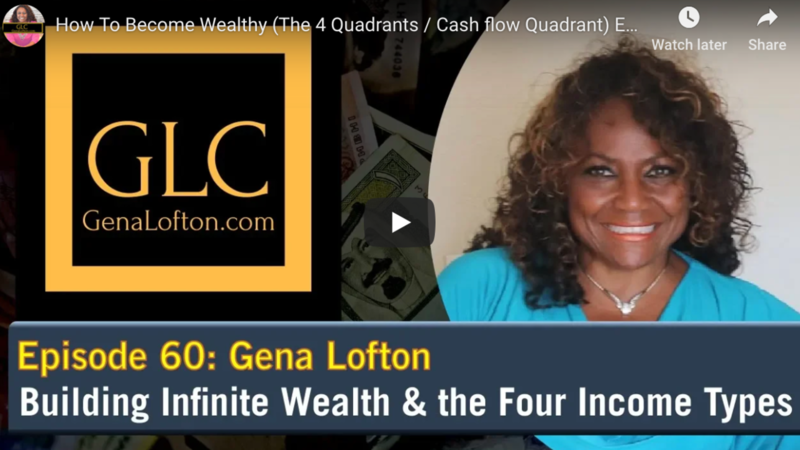 This week Gena discusses the Cash Flow Quadrant and the four (4) Ways Income is Created. The people on the Left Side of the quadrant are Employees and/or Self-employed. This is where 95% of the population exists yet, they control only 5% of the wealth, primarily, because they own NO assets and pay the highest tax rate. The left side could pay an excess of 40% in Taxes, depending upon their income level and their State residency. Alternatively, people on the Right side of the quadrant are Business Owners and/or Investors and pay as little as 0% to 20% in taxes. This is why they control 95% of the wealth. 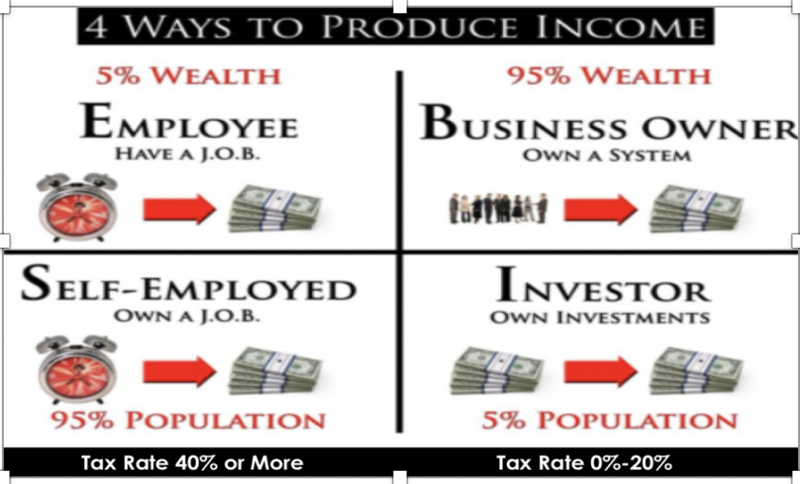 The earlier one learns the different types of income and begins generating that which is the most tax efficient on the right side of the quadrant, the higher the likelihood that they will have a lifetime of financial abundance and not worry about outliving their money. I want to introduce you all to Michael, we met recently at FreedomFest and he is both amazing and knowledgeable. He has an extensive background in commercial real estate investing and is principal of Concordia Realty. Concordia Realty specializes in shopping plazas and retail properties. They prefer to purchase operational commercial projects with existing income. They concentrate on strip shopping centers and they occasionally renovate or restructure existing commercial properties. They have over a million square feet of retail space located in the Illinois, Indiana, and Michigan markets. Increasingly they are interested in Ohio and Wisconsin. They continually look for good opportunities and are working to expand into new areas. 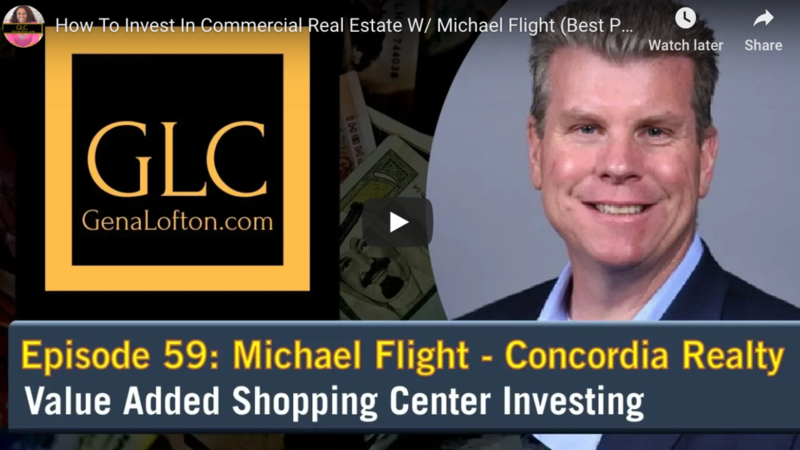 Michael became involved in real estate shortly after college where he worked as a broker and then began working with a syndicator that owned shopping malls. In 1990, he started out on his own by founding Concordia. Are Most People in Society Today Insane? 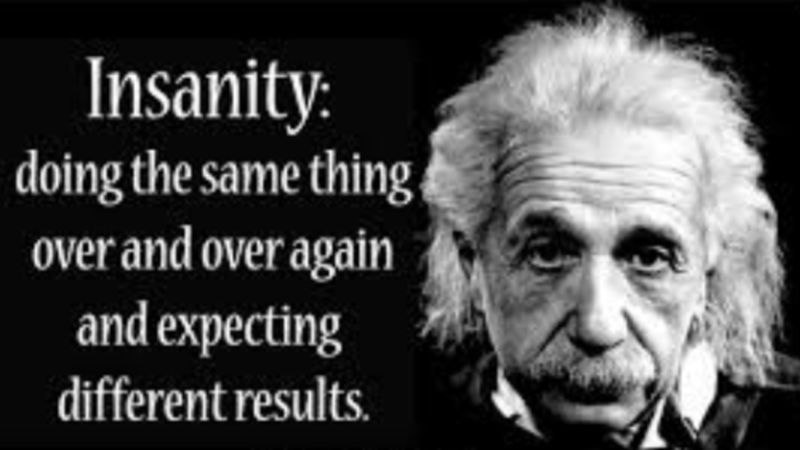 Why are people doing the same thing over and over and expecting a different result? Do they NOT know the definition of Insanity? Did you hear the recent news? Baby Boomers are filing for Bankruptcy at an alarming rate. Older Americans have a higher presence in the U.S. bankruptcy system than ever before, according to a new report. The rate at which Americans ages 65 and older are filing for bankruptcy has increased two-fold since 2013, the study by the Consumer Bankruptcy Project found. Meanwhile, there has been a nearly 500% increase in the number of older Americans in the bankruptcy system, the study – first reported by The New York Times – showed. While more than 12% of filers are now seniors, just 2.1% were in 1991. The average senior files for bankruptcy more than $17,390 in the red. I had the pleasure of meeting with Derek Uldricks, the President of Virtua Capital Management. Virtual is a global private equity firm specializing in the commercial real estate asset class. They invest in real estate across the United States. Their background is in commercial real estate financing, and restructuring and they have a very experienced executive team. Virtua focuses on multi-family, single family, and hospitality. 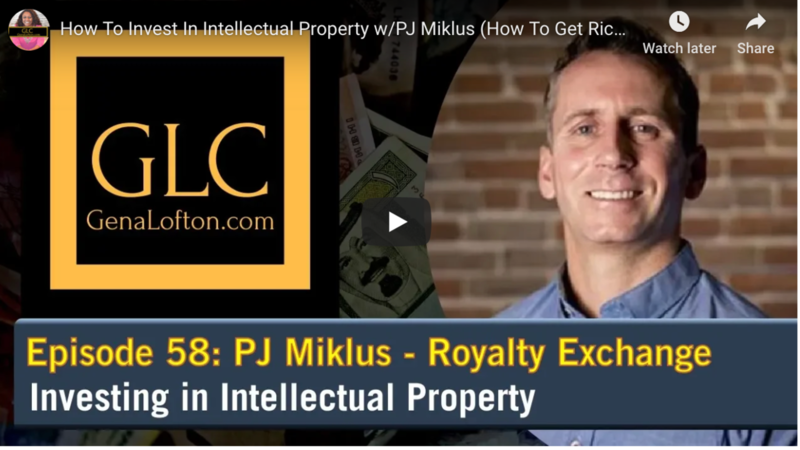 Derek discusses how they set up their real estate portfolios and mitigate risk. When the downturn happened in 2008, there was a lot of investors with negative equity. They helped them turn around properties. Today his role at Virtua is to oversee the funds, inclusive of Opportunity Zone Funds and assist with investment decisions. Jeremy is a passive cash flow focused investor who has had a focus on real estate since 2002. He wanted the predictability of steady cash-flow instead of the ups and downs of the stock market. He diversifies across operators, geographies and asset classes. He moved from Montreal to Pennsylvania in 2002 where he attended university. Afterward, he moved to Los Angela’s where he worked for Disney. While working, he decided to invest in cash-flow assets that eventually gave him the flexibility to leave the corporate world. Jeremy defines his view of active versus passive investing. For him, the difference is centers around direct control of assets. Passive investors generally do not have a direct say in the investment while active investors own, control and direct assets. He discusses the pros and cons of investing passively versus active investing. Passive investing runs slightly higher risks of fraud as you usually have little control. Al Adler is CEO of ABA Energy Corporation joins us to provide a broad overview of the Oil and Gas sector. He describes his early career in the Oil and Gas industry and how he started out in the oil patch in the United States and then traveled to several countries. After a few years, he broke out on his own by heading up a companies Oil and Gas branch. That ended up being a tremendous success which spring-boarded him into launching the company ABA Energy in 1991. Gary Rahman describes his upbringing in Chicago with a single mom. When he was ten he realized he wanted a better future for his children. Although his mother suffered from depression and had a lot of financial difficulties she always encouraged him. Gary says the universe has a way of answering your call. For him, there has always been a lot of self-determination and persistence. The real crux of his message is that people need to get out of their own way.